Amateur Astronomy: What can we see? Amateur astronomers, what would you say is or is not possible through an average telescope/camera rig? We are told Uranus, Neptune, Pluto, Charon, extremely distant stars (invisible to the naked eye) and distant galaxies are possible to photograph "even by amateurs". This is a typical argument from NASA proponents. Amusingly, they rarely claim satellites can be photographed, except of course for their ISIS ISS god. From what I understood recently after reading about it, however, is that the three major planet/moon systems (beyond Jupiter and Saturn) are utterly invisible things merely calculated into existence by predictions, largely based on Kepler's fabricated data (which had never been taken from pure observation). So ... can someone amongst us please tell us what they know to be true about true telescope/camera capabilities (from the basis of a budget of — say — $1000, in a place with very low light pollution, and excluding all large telescopes which are closed to the public)? Re: Amateur Astronomy: What can we see? hoi.polloi wrote: Amateur astronomers, what would you say is or is not possible through an average telescope/camera rig? As simple as it may sound, that´s an absolutely fundamental question to ask. If only it had been asked earlier! By the way, I have actually seen Saturn and its ring/stripe glowing in a telescope, so not everything beyond Jupiter is pure math. hoi.polloi » September 1st, 2015, 7:13 am wrote: From what I understood recently after reading about it, however, is that the three major planet/moon systems (beyond Jupiter and Saturn) are utterly invisible things merely calculated into existence by predictions, largely based on Kepler's fabricated data (which had never been taken from pure observation). Uranus and Neptune can be seen with an average telescope (although their moons certainly cannot). You just have to know exactly where to look. They are nowhere near as large or bright as Jupiter or Saturn and don't appear different from faint stars, although Neptune has a faint blue hue that distinguishes it from a star, and both Uranus and Neptune move against the background stars over the course of successive nightly viewings. They may have been predicted mathematically, but they are most definitely viewable. With a $1000 budget you could get an excellent scope with a motorized equatorial mount and built-in camera that will locate and track them for you. I, myself, don't have such a setup - just a Meade infinity 102mm refractor with an Alt/Az mount and, while I don't have a camera setup to take pictures through the telescope, I can spot Neptune through the eyepiece. Never seen Pluto however. Uranus, Neptune and Pluto definitely exist (and can be observed) - and their orbital periods (as well as the parallax that they show to an earthly observer) perfectly coincide with / and confirm my upcoming model. I won't let you say otherwise - as it would be tantamount to disinforming our readers. So don't touch my Uranus, Neptune and Pluto, thanks! Just go to, say, February 5, 2003 (at 11 am looking South) and you will promptly find Uranus, Neptune and Pluto. Okay, good to hear gentlemen. So the little Pluto Charon "system" can be captured with a photograph in such a camera? Please understand that I don't mean to discredit anything that is true. That is why I ask. I trust telescopes. Computers can show anything at all, and the beautiful Neave planetarium is accurate with everything else so I don't see why it would be wrong about the Pluto Charon thingie said to be out there. I would just like to know if it can be observed and resolved really well with a telescope and if anyone on the forum has done that. Normally, I'd say, we don't ask others to do research for us, which is why I plan on beginning my own foray into astronomy. Just thought I would ask because I want to know what is perfectly expected. The story of Pluto's naming is very Disney-esque. However that is all I say about it. I don't presently have reason to doubt Pluto or Charon. As for your system, Simon, my inquiries should do nothing against it. I think your system should probably be adopted by schools the world over once it is revealed. It simply makes sense. And I understand if you don't want anything like this topic on your forum for now. Still, isn't it interesting that NASA claims we can resolve things that the average person cannot see? Such as huge galaxies and "gaseous clouds" and such? This topic, I think, also covers those strange things that might only really exist in an imaginative illustration. hoi.polloi » October 20th, 2017, 8:35 pm wrote: So the little Pluto Charon "system" can be captured with a photograph in such a camera? I seriously doubt it. Locating and imaging Pluto would be an extremely difficult challenge, as it is magnitude 14 (very small and dim) and there are around 29 million magnitude 14 stars in the celestial sphere (see http://www.stargazing.net/david/constel ... stars.html). It won't appear any different than a dim star of the same magnitude, of which there will be many in the field of view. Positively identifying it would require images taken of the same spot several days apart to see which small speck moved during that time. Discerning Pluto and Charon separately would probably require an observatory. In addition to the planets and the Sun of course, I've become very interested in learning what is relatively close to us. The following video suggests there are big asteroids in close orbits around the Earth. I do have a concern with the video, and of course many questions. First, I've never seen anything like that transiting the moon, only birds and airplanes. I've asked a couple people who have filmed the moon and they've never seen them either. Then of course, what are they? The objects seem to be oddly shaped and rotating which seem to be consistent with asteroids. They also seem to be traveling relatively slowly, at least compared to meteors. At first I wondered if they were high altitude balloons, but I really have no idea. I haven't done any estimate as to their size or distance, but I would guess they are above any significant atmosphere. Or maybe they are near the atmosphere or even in it and eventually become the meteors we see. Either way, I'm very curious about them. The person who posted the video, Crrow777, probably deserves a thread of his own, but I don't want to go off topic and discuss his work here. I've checked Crow777's YT channel, and while the 'hologram moon' hypothesis is a bit too much for me, I've found an interesting point in one of the comments of the videos. Namely, the existence of tides. We've always been told that tides are caused by gravitational pull of the Moon, and, to a lesser extent, of the Sun. But how can this explain that there are two high-tides daily? One of them is the 'antipodal' high tide, that happens in the opposite side to where the moon is. Maybe that can be explained in terms of resonances and so on, but anyway it's not as simple as we've been told. Plus, the "official" explanations tells us about a 'tidal wave' that circles the earth. The problem with this is oceans are not continuous, and in fact this 'wave' couldn't jump over land masses. So, we'd have the atlantic/pacific/indian oceans basins, that are to all practical effects, not communicated. Altair » October 31st, 2017, 3:53 am wrote: I've checked Crow777's YT channel, and while the 'hologram moon' hypothesis is a bit too much for me, I've found an interesting point in one of the comments of the videos. Namely, the existence of tides. We've always been told that tides are caused by gravitational pull of the Moon, and, to a lesser extent, of the Sun. But how can this explain that there are two high-tides daily? One of them is the 'antipodal' high tide, that happens in the opposite side to where the moon is. Maybe that can be explained in terms of resonances and so on, but anyway it's not as simple as we've been told. Yeah, the image with the two bulges is a bad representation because it always shows the bulges as swells of water enveloping the earth. Its better to show the bulges as tidal forces instead of the actual tides. Even that is simplified though because there are other dynamics at play such as water depth, ocean currents, etc. There's an animation showing actual tide data over a 24 hour period on the OSU Tidal Data Inversion page. It's a flash animation so I can't embed it. And the map is confusing due to it being an equirectangular projection. Here's a nice animation from Wickedpedia showing the tidal forces over an entire lunar month. I've seen some of Crrow777's stuff too, and while some of it is interesting he also seemed to weave in a lot of disinfo (orbs, flat earth, lunar wave hologram, etc). Just came across these short time-lapse videos/gifs, claiming to be of geostationary satellites. Here's just one such example. Seems consistent with the claims, but I know these videos could be easy to fake. It would be an easy experiment to do, if I could get a good camera. Here's what those specks of light (THE ALLEGED 'GEOSTATIONARY SATELLITES') shown in your above image may very well be. The greatest advancement of our modern times in the field of telescope technology is something called "Adaptive Optics'. Today, the world's largest observatories are all using this state-of-the-art imaging enhancement. They are now (rightly) boasting about the fact that their huge earthbound telescopes can resolve stars FAR more sharply than even "NASA's Hubble telescope". You can read about Adaptive Optics in more detail - in the various links that I will provide in this post. However, to make a long story short, let me just briefly summarize in simple words what it's all about. "Adaptive optics (AO) is a technology used to improve the performance of optical systems by reducing the effect of wavefront distortions: it aims at correcting the deformations of an incoming wavefront by deforming a mirror in order to compensate for the distortion. It is used in astronomical telescopes and laser communication systems to remove the effects of atmospheric distortion (...)"
http://slideplayer.com/slide/11388388/ (Detecting 'possibly Earth-like exoplanets' - among binary systems - is now all the rage within the astronomical community). So now you may ask: "How do they do it? How on Earth does it work"? Well, in short, they deflect the celestial images viewed in their huge telescope's into a 'flexible / deforming' mirror which electronically "straightens" the incoming wavefront (full of turbulence / scattering / blurriness) - thus sharpening the same by many orders of magnitude. To achieve this, they need to use a sharp reference star - something which isn't always to be found in any given target spot of our skies that they wish to analyze. And that's a pesky problem. So they have invented a wonderful way to solve this pesky problem: they create an artificial guide star - with the help of powerful lasers. (Please note that "they" are not NASA clowns: they are real / serious scientists developing real solutions to enhance astronomical observations). "The laser used here on these observatories takes advantage of a special property of our atmosphere: certain elements are segregated from others at specific altitudes. One of the elements that’s very rare is sodium, which happens to be concentrated in a thin layer about 100 km (60 miles) up. If you fire a sodium laser into the air, it will excite those sodium atoms found at that particular altitude, which then spontaneously de-excite, creating an artificial light source to be used as a guide star." The artificial stars allow the adaptive optics systems to compensate for the blurring caused by the Earth’s atmosphere and so that the telescope can create sharp images. If astronomers working with ground-based telescopes didn’t have guide stars to work with, the image quality would turn out extremely blurry, like a backyard telescope, reports Heather Gross for Air & Space. 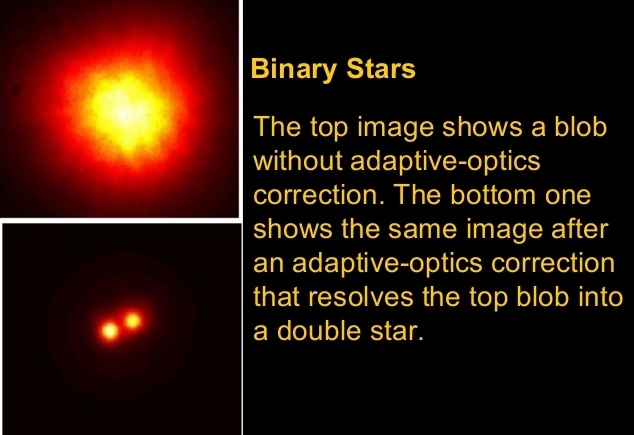 These systems are generally referred to as adaptive optics. Nowadays, of course, lasers come in all sorts of shapes and forms. We usually associate lasers with those green beams used at rock concerts - or those consumer-lasers (which go from $30 upwards) used by amateur astronomers to point at the stars. However, you may also find slightly more costly consumer lasers that work in the infrared wavelength spectrum - and such lasers will not produce any visible beam at all. In the light of this (pun intended), dear molodyets, we may therefore quite reasonably speculate that the specks of light shown in your above image (THE ALLEGED 'GEOSTATIONARY SATELLITES') are, quite simply, artificially-created. Furthermore, and even though this would involve a higher level of sophistication, one may reasonably speculate that even the moving specks of light that we see in our skies (such as, for instance, the "ISS") are artificially-created. After all, the "ISS" is supposed to cruise at about 400 km of altitude, smack in the middle of the ionosphere: the ionosphere is, of course, the layer which efficiently bounces back all sorts of wavelengths that we use to diffuse signals all over our globe - so it wouldn't be a stretch to think that NASA has found a way to calibrate their "ISS laser" to a certain wavelength, so as to make the "Thing" appear as if it were cruising at 400 km of altitude. With literally hundreds of military bases spread around Earth, I'd say that a number of synchronized / relayed lasers could easily create the illusion of a spacecraft orbiting our Earth - day after day. Quite frankly, to think that this small Japanese company has 'beaten / superseded' NASA's unlimited research resources in the field of laser technology - is (in my humble opinion) very, very unlikely. Moreover, I trust that this forum's readers will agree that harnessing this sort of "space imaging technology" must have been a TOP priority for NASA - ever since the inception of their ongoing MEGA HOAX. Since the idea of creating artificial stars was already proposed back in the 1950's, we may reasonably surmise that NASA has long mastered and perfected this particular space-imaging laser technology. simonshack » December 7th, 2017, 12:43 pm wrote: So they have invented a wonderful way to solve this pesky problem: they create an artificial guide star - with the help of powerful lasers. so as to appear as if the "Thing" were cruising at 400 km of altitude. With literally hundreds of military bases spread around Earth, I'd say that a number of synchronized / relayed lasers could easily create the illusion of a spacecraft orbiting our Earth - day after day. Wow! A laser light show in the upper atmosphere. That possibility makes sense to me now and really changes the situation. It's also another example of how the atmospheric electric field can separate the elements, and consequently another example of how the PTB use real science they don't teach the public. I've got some studying to do. My first thought, however, was about how these artificial stars would appear to an observer far away from the laser source. The artificial star would appear as an orange (589nm) line, the length of the sodium layer. I made a simple graphic, and included a pathetic curved line for the ground lest someone accuse me of suggesting a flat Earth. As an extreme example, if the sodium layer is several kilometers thick, then the laser will excite a long line of atoms several km thick. For an observer at the laser source, the artificial star would appear as a single point, but for observers further away, the star will look like a line. For the more practical situation, the sodium layer may indeed be small, but a powerful enough telescope should be able to resolve the length. Please forgive me for asking for someone else to do the experiment, but it would be nice for someone with the equipment to resolve one of these geostationary satellites to see if it is orange and is a line.